Four Teams to vie for Jamaican Crown! Pete Myers, "'LASCO CHESS LEAGUE HEADED FOR EXCITING FINISH," Jamaican Chess Federation, 13 July 2006 (Clarendon, Jamaica). With only two rounds left in the inaugural LASCO Chess League, four teams are still in with a chance to claim the top prize. Tournament favourites Knightmares are currently riding atop the standings with 30½ points, followed by the Blitzkrieg Boys on 27 and Varcon CC and Gladiators tied on 24½ points. Completing the field are the King Rippers on 17½, Reggae Knights on 13½ and Little Giants on 6½. 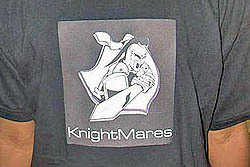 Knightmares however have only one remaining match, while their three closest rivals each have two matches. As each match can yield a maximum of four points for each team, any number can play when the final two rounds are played this Saturday and Sunday, at 1 pm at the Holy Childhood Library. On Saturday, Knightmares will tackle Reggae Knights, Blitzkrieg Boys will face Gladiators and Varcon CC will challenge King Rippers. On Sunday, Blitzkrieg will be up against Reggae Knights, Varcon CC will take on the Little Giants and Gladiators will match wits with King Rippers. The battle for individual board prizes has also yielded some interesting contests, which will come down to the wire on the weekend. On Board 1, Warren Elliott playing for the Knightmares, has already copped the gold medal with 8½/10, as he cannot be overtaken even if he loses his final game on Saturday. Three players, Duane Rowe 7/10 of the Gladiators, Russel Porter 6/10 of Varcon CC and Malaku Lorne 5/9 of the Blitzkrieg Boys, will each battle through their last two games in search of the silver and bronze awards. On Board 2, Shane Matthews 7/9 of the Gladiators, Jomo Pitterson 6/9 of the Knightmares and Brandon Wilson 6½/10 of the Blitzkrieg Boys will all be seeking gold. On Board 3, Peter Myers 7½/10 of Varcon CC, Equitable Brown 7½/10 of the Knightmares and Christopher Buchanan 4/6 of the Blitzkrieg Boys will battle it out for the top prize. On Board 4, the battle for gold will be between Gary Hew 5/8 of the King Rippers and Allan Wilson 5/7 of the Blitzkrieg Boys.